2017 SnowEx 9.6 HDV for sale in Bluffton, IN. Outdoor Concepts Inc.
Double-Acting Angle Cylinders : Durable double-acting angle cylinders push and pull the wings forward and back under the heaviest snow loads. They also can hold the wings firmly in place for optimum back dragging performance. Snow Catcher: An integrated snow catcher helps keep snow from spilling over the top of the plow. Adjustable Center Cutting Edge: Gap can be adjusted to help prevent snow from slipping between pivot edges. Responsive Direct Lift : The direct lift system includes a massive cylinder that delivers a wide range of motion, impressive lifting power and high stacking performance. Large 1-1/4" Center Pin: Center pin is robust, yet positioned to make the plow completely flat when in straight blade mode, enhancing snow rolling performance. Hand-Held Controls: Choose between the POWER GRIP™ control with backlit buttons or the compact joystick control. Both feature power “on" and float LEDs and are FLEET FLEX system enabled. Easy Access Components Cover : Hydraulic components are protected with a durable poly cover that is easy to remove for quick maintenance access. FLEET FLEX Electrical System : The FLEET FLEX electrical system provides complete fleet interchangeability. 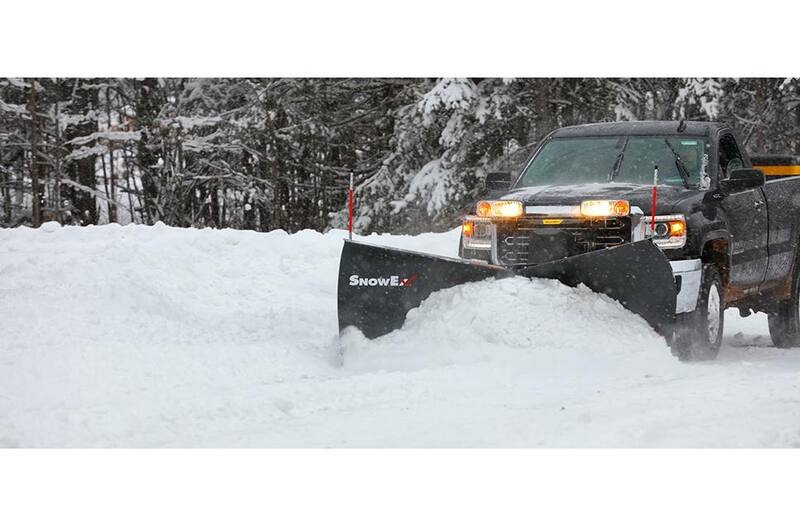 Any SnowEx plow can be used on any truck. Self-Aligning Receiver Brackets: Receivers simplify attachment and are removable when not in use. Stand-Free Design : Because the blade is stable in the V position for either attaching or detaching, no stand is needed. Flared Moldboard: Tall flared wings throw snow higher and farther to deliver exceptional snow clearing results. Trip-Edge Protection: Independent trip edge protects the plow, truck and operator when encountering obstacles, and functions in any position (scoop, V, angle or straight). Because only the edge trips, snow loads are never lost. Automatixx® Attachment System : The Automatixx attachment system provides fast and easy snowplow hook-up that can all be handled from one side of the truck. Thicker Cutting Edges: Maximize durability and service life with thicker cutting edges. Back Drag Edge: Easy bolt-on installation, back drag edges deliver cleaner, consistent scraping and back dragging in tight areas. Shoe Assembly Kit: The shoe assembly kit lets you set the scraping height of the blade, extending the life of the cutting edge and base angle for use when plowing rocky and abrasive surfaces. Deflector Kit: Enhance snow containment, and help prevent it from blowing onto the windshield, with a rubber deflector. Two sizes available: 10" or Extended Length 18". Taller Blade Guides : Available in 36" lengths, commercial blade guides are highly visible bright red, enhanced with reflective tape. Curb Guard Kit: Bolt-on curb guards protect the outer edge of your plow from wear associated with curbs and sidewalks. Bolt-On Wing Extensions: Maximize your blade width and carrying capacity by adding 9-inch wing extensions to each side. The extra 18 inches of plowing surface reduces the number of necessary passes, cutting down job time.